Facts about Black Back Butterflyfish. "Scientific name for Black Back Butterflyfish is Chaetodon melannotus". The Black Back Butterflyfish varieties hail from Indonesia, the Papua New Guinea and Fiji Islandsand they are largely found in the Indo-Pacific region, ranging from East Africa and the Red Sea to Samoa, to the southern parts of Japan and all through Micronesia. 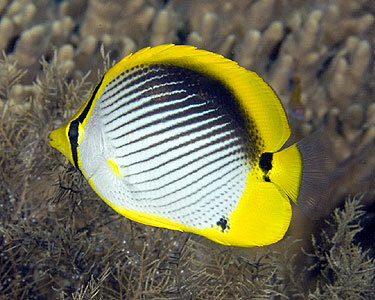 The Black Back Butterflyfish are less found on the uncovered parts of reefs. They can be easily seen in water at a depth, ranging from 13 to 65 feet (4 to 20 meters). They move solitarily, in pairs during the breeding period. Juveniles are commonly seen inshore, in couples or moving in small clusters. Black Back Butterflyfish are a nocturnal and very peaceful. When matured, the average-sized and non-violent Black Back Butterflyfish breed is capable of attaining a maximum body length of 6 inches (15 cm), measured from the tip of the nose of the fish to the foot of its tail. The Black Back Butterflyfish breed has a white-colored body with a sequence of black-colored diagonal lines on both sides of its body. They have a yellow-colored fins and a yellow-colored face, with a black-colored eye band. When developed in an aquarium, the Black Back Butterflyfish breeds need an abundance of hiding places and an abundance of space to swim. They used to change their body color during the nighttime or when scared, and the dorsal part of its body changes into black color except for two white-colored patches. When kept in an aquarium, the Black Back Butterflyfish breeds prefer a tank with a minimum capacity of 120 gallons (455 liters), with the temperature of the water, ranging from 72 degree Fahrenheit to 78 degree Fahrenheit, with the water pH levels between 8.1 and 8.4. Black Back Butterflyfish can live peacefully with their own species and other fish check with the pet store which are good tank mates. Black Back Butterflyfish live solitary or in pairs. In the aquarium, they are fed with an assortment of meaty foods that are rich in vitamin or color attractive food to maintain the colors of these fish crisp. The Black Back Butterflyfish should be fed a variety of meaty foods such as frozen or live vitamin enriched brine shrimp, krill, mysis shrimp, mussels, chopped clams, and other meaty marine foods. The Black Back Butterflyfish is a nocturnal carnivores meaning: an animal that feeds on flesh (Meat) at night. Black Back In the wild they mainly feed on coral polyps, anemones, nudibranchs and a variation of organisms and sometimes soft corals. Black Back Butterflyfish is a variety of butterflyfish that comes from the Chaetodontidae family. The average lifespan of the Black Back Butterflyfish breed ranges from 5 years to 7 years.